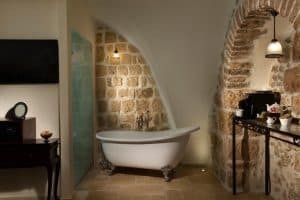 Located in Ein Kerem village, Alegra Boutique Hotel is 200 m from the Church of the Visitation. 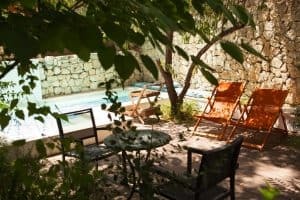 It offers a gourmet restaurant, a sauna in its fruit orchard, and luxurious suites with exposed-stone walls.With Persian rugs and contemporary bathrooms, the suites at the Alegra are a mix of old and new. Each is uniquely decorated and comes with air conditioning, satellite TV and a tea/coffee maker. A safe is also included. A daily Israeli breakfast is provided, including homemade bread, omelette and salad. The restaurant has an open kitchen and serves a generous dinner of up to 8 courses. 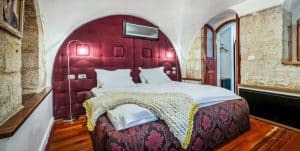 Housed in an Arabesque building dating from 1850, the property has contemporary Israeli artwork in public areas. There is an outdoor pool, and massage treatments are also available. The Old City of Jerusalem is 9 km from the hotel. The Yad Vashem Memorial is a 10-minute drive away.